How Hairdressers Can Help Fight Skin Cancer : Shots - Health News Over a lifetime, our heads and necks receive a ton of exposure to the sun's UV rays. But most medical checkups don't include exhaustive exams of our hair and head. 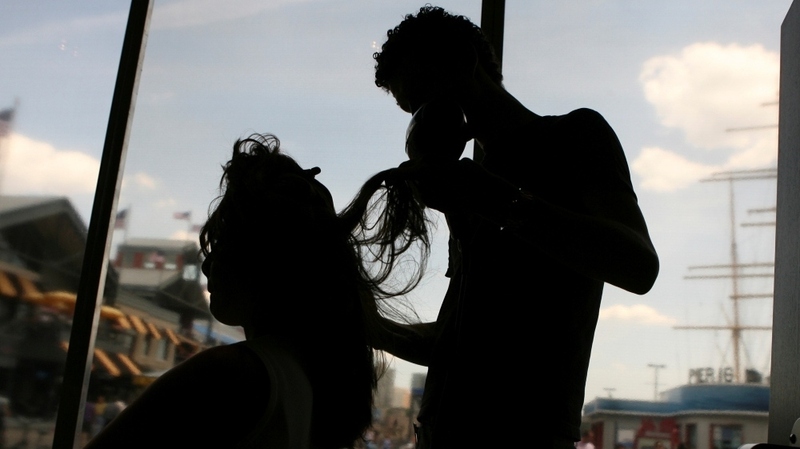 So public health researchers want to recruit hair stylists to help. It turns out, some of them are already performing informal skin cancer exams on clients. Public officials think hair stylists could play a vital role in physical health, too, by helping spot potentially cancerous skin lesions on their clients' scalp, neck and face. Research published Monday in the Archives of Dermatology suggests some stylists and barbers are already informally performing these skin cancer exams on clients. In a survey of 203 Houston-area hair salon workers, 58 percent of respondents told researchers from Harvard's School of Public Health that they had urged a client at least once to get a mole checked out by a medical professional. "Almost every dermatologist I've talked to anecdotally has said to me, Yes, I've had a melanoma case referred to me by a hair professional," Alan Geller, a senior lecturer at Harvard and study co-author, tells Shots. Hairdressers and barbers tend to enjoy an easy rapport with clients, see them regularly and often share advice with them. All of which explains why, over the years, public health officials have recruited salon workers' help in various health awareness campaigns — such as encouraging women to seek mammograms and men to get prostate screenings. Many of these efforts have focused on reaching minority communities. Getting hair salons to help in the fight against head and neck cancers made a lot of sense to Geller and his colleagues: Stylists and barbers spend much of their time staring at their clients' scalps and necks. Over a lifetime, these areas receive a ton of exposure to the sun's UV rays. More than 80 percent of the most common types of skin cancers — squamous cell carcinomas and basal cell carcinomas — occur on the scalp, neck and face. And melanomas, the most dangerous form of skin cancer, tend to be "disproportionately fatal" on the scalp, Geller says, perhaps because an exhaustive exam of the head and hair isn't a standard part of most visits to the doctor. "We asked ourselves, who might be most predisposed to looking at the neck and face?" Gellar says. He and his colleagues wanted to know if hair professionals would be willing to receive more formal training in spotting different types of skin cancers; 49 percent of survey respondents said yes. Even without training, many of the hair care workers were already performing their own exams. The survey found 37 percent said they had checked out more than half of their clients' scalps in the month prior to the survey, which was conducted in January 2010. About a third said they'd looked at more than half of clients' necks. Geller acknowledges it's possible some hair stylists may cause needless worry in clients by pointing out moles and lesions that turn out to be harmless. "I think the best way that we're trying to reassure customers," he says, "is to have hair professionals say, 'I'm not an expert. But maybe the most important thing you can do is to see your doctor as soon as possible.' "